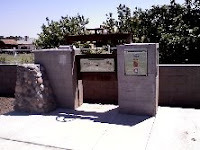 Picture of: a historical marker that I pass every day on the way to the post office. Today I: read a set of postings by Liz Warren; went to the post office; was inspired by Liz's post to pay attention to the history of my own area- so started a research project on the "Lateral 22. 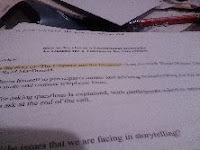 Over the weekend, I will write more at my storytelling blog and link this when it is done. 07.29.2008 Tuesday: The Vanishing Post-Show Soda. Picture of: me telling stories to kids in the school gym today. Musta been a wide angle lens. Today I: made the post office run; packed up for the school show and took daughters #3 and #4 as well as cousin #3; presented two storytelling school shows; bought my assistants fountain drinks on the way home. Learned that there is a problem with counters that have cut-out holes for trash cans below, "Umm, Poppa, my drink just vanished off the counter...oh there it is down there. "; followed up with client regarding previous invoice; did some historical and on-site research into some local history stories (more on that tomorrow); responded to some good comments about a new model for a storytelling conference; made a steamed colcannon dinner for my family. 07.28.2008 Monday: Can You Hear Me Now? *Blogish stuff: We're about 2/3 the way done with 2008 and you'll notice I post a lot of the daily minutiae of being a working artist. 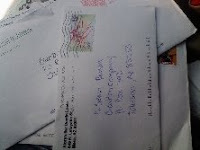 For example it's another picture of mail today. Although I don't post every gig I have on this blog but here is just a thought for those of you contemplating a career as a full-time artist: I hope this blog helps you to recognize the daily grind of this lifestyle. A grind like every other job also has. I am honored to work with my audiences, but the storytelling business is a business. It's not all hearts, unicorns, peace and flowers. It's a job. One I love and one I am lucky to have created...but it is a job. Our telecourse tonight was about this as well. I always appreciate your comments and thank you for sharing them. 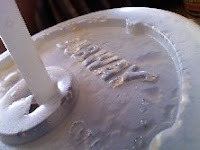 Picture of: the top of daughter #3's drink cup at the fast-food place. Today I: did a quick trip to the store; ate early lunch with daughter #3; prepped broadcast messages for Monday's telecourse; spent the rest of the day ill so there's not much to report today about my storytelling business. Food and illness not connected, btw. 07.26.2008 Saturday: Oodles of Noodles. Picture of: assistants peering at rows and rows of drying homemade noodles. Today I: took the day off and made chicken soup, spicy vegetarian soup and spinach noodles for both and was assisted by assistants daughter #4 and cousin #3. Blog of this event is at this link here. 07.25.2008 Friday: The Enemy is Us. Picture of: a storm. Got it at this website. Today I: remembered that my role is to be the lightning rod anytime somebody doesn't want to look at the future of storytelling or take it past where it is; also watched "Joan of Arcadia" running again on the sci-fi network- great quote from there: "The first rule of the game of chess is to not play the other guy's game, just play your own. "; was reminded that my style of teaching is not good for those who prefer unicorns and butterflies- when you come to the "Outside In Storytelling Marketing Boot Camp" in just a few weeks (space available), I and my people will treat you like gold but I will tell you what you need to hear not what you want to hear about the realities of being a working artist; it rained like crazy tonight. Oops, I used italics and quotes at the same time. 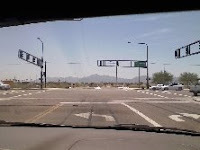 Picture of: the road (out the window of the van) near my house as daughter #3 takes a picture on my daily errand run. Today I: made the errand run to the post office and bank; spoke with a client about a new creativity workshop I'd like to do for her in California; made the official annoucement to the vendors that we are closing the storytellingproducts.com store; bought a few groceries; sorted through an old stack of paperwork; presented the latest of our telecourses on making a storytelling CD; spoke afterwards to a new coaching client regarding their audio work. 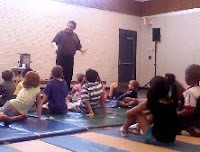 Picture of: me telling stories to the 2nd grade and under group at a local summer school show. Today I: prepped for the storytelling school show and talked with their staff; travelled to the show and set up with daughters #1 and #3; performed two shows; did the post office run; attended yet again more marketing telecourse-workshops presented by others; laid out the plan for new storyteller products to be released from Storyteller.net; posted a blog about today's show; ate daughter #3's cookies she baked- nicely done. 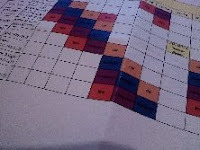 Picture of: the schedule for the Tuesday school shows I am doing this month. Today I: took my kids to the movies and the other kid to work; did a post office run; at the bank, dealt with a bounced check presented to me by a client- mistakes happen but yikes it's expensive; updated and adapted the "Ancient Secrets" telecourse; presented the telecourse; worked on a new "back of the room" product; attended a telecourse presented by another person; started to inventory what promo products I have and which I do not have; prepped through some ideas for the school show tomorrow; answered emails I was behind on; spoke to a person on the phone who was mad I did not return their sales call- that's just a low priority for me; realized I don't have enough energy to respond to all the blogs I'd like to respond to; realized that I can't spell "tomorrow" and "scissors" ever correctly the first time. Picture of: My oldest daughter (young adult) playing on the floor with kittens. She volunteers (around 5 years now) at a no-kill shelter every Thursday. Folks, please get your animals spayed or neutered. Really. 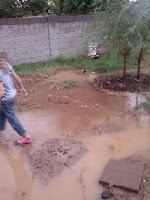 Picture of: daughter #4 walking around in our rain-soaked back yard today after one of our monster (really) monsoon storms. Picture of: the outline for the TeleCourse I presented earlier today. 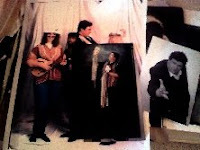 Picture of: old pictures of me and my performing arts troupe ("Friday's Faces") from years back: we started in 1986. 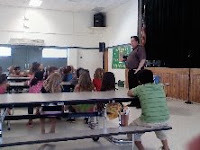 Picture of: me telling at summer-school program today. 07.07.08 Monday: Picking and Chosing. 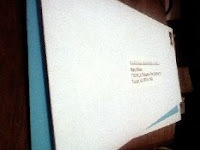 Picture of: pile of letters on my desk, waiting to go out tomorrow. Today I:Over the last few days I: Laid low for the holidays and worked out what to keep and what to throw away; updated my mailing database with another handful of new clients and interested parties; worked through some registration issues for the OISBC Marketing event; produced a mailing for a super deal on camp registration- I can't tell you HOW DEEPLY I FEEL THE NEED FOR YOU TO JOIN US AT THIS CAMP in August of you are trying to build your business- a hard economy makes it a GREAT time for marketing opportunities; had dinner with a kid who used to be in one of my youth groups a long time ago, he's not such a kid now; edited audio files for release; added more lessons to the free Ecourse I am running (join); rewrote the scripts for the next free TeleConferences (join them too); prepped show order for school show tomorrow; sorry for missing days with you, some days there is only so much energy left in my fms-filled days; spoke on the phone to a storyteller in a nearby state about the state of storytelling in our states. 07.01.2008 Tuesday: Hey, We're 1/2 Way Through 2008. Picture of: school kids gathering for my summer school storytelling show today.